This is my song of choice for June...Family History - I am Doing It. So I thought why not have a "real" family tree to teach this song? I printed them on card stock and laminated. Before Primary, tape the pictures (or use magnets) under random chairs. I am going to use the Attention-Getter found in A Children's Songbook Companion (You can find more information on this book HERE). But instead of singing the song as is suggested, I'm going to use a CD player and the song on CD. Tell the kids to look under their chairs to find clip art pictures with keywords. 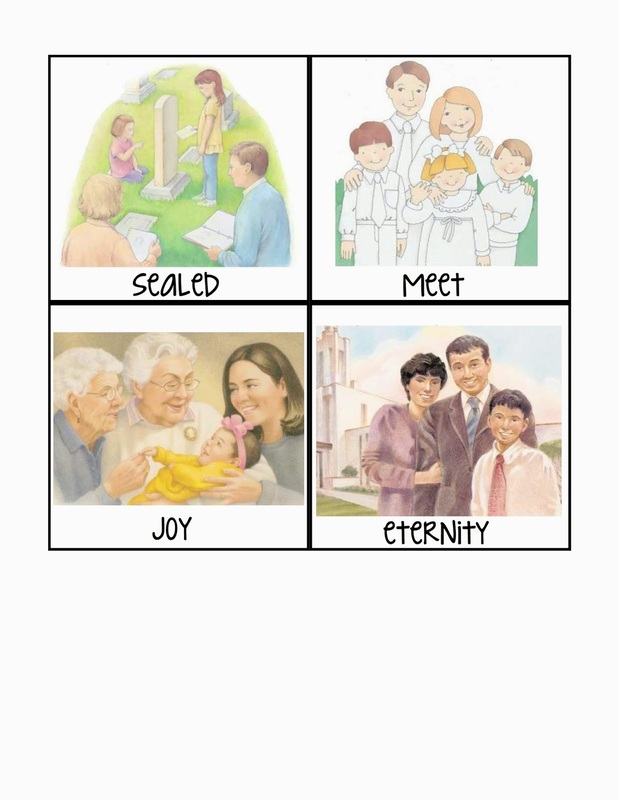 Play the song on the CD player again to find which clip art picture comes first. Have the child with the first picture come pin it to the tree. Once added, sing the corresponding phrase, and maybe discuss it quickly (i.e. 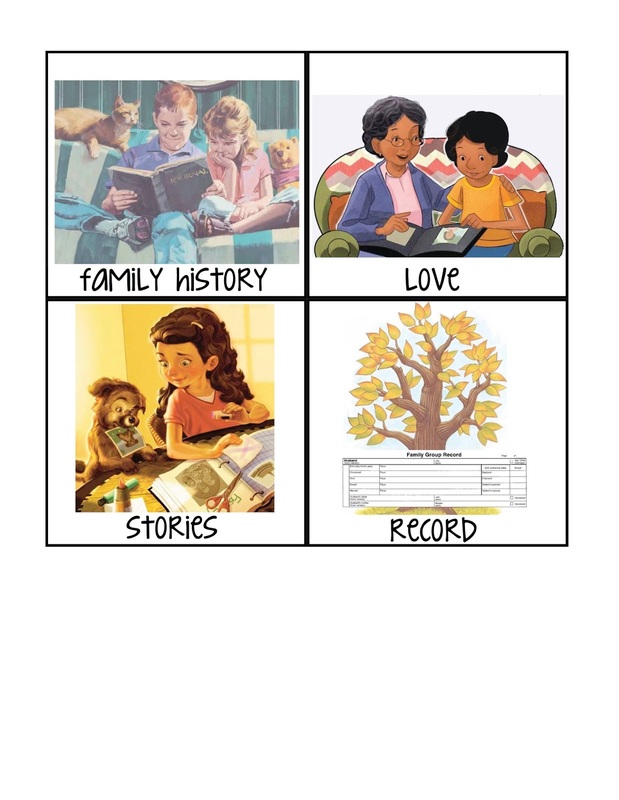 "Family history" is the written stories and records of the family who lived before you), then gradually add on until the song has been listened to on the CD, the clip art pictures are all hung on the tree and the song has been sung several times. If time permits (you may get through this quickly - especially in Sr.), pass out 1/4 sheets of paper with coloring utensils and let the kids draw a picture of an ancestor or family member. Play the song as they color. When finished, they can come add it to the "Family Tree" using a clothespin. This way everyone can get a turn to come pin something on to the tree ;). Also signifying that we are all brothers and sisters that belong to the same giant family tree! For Junior Primary I will be posting the words to the song as we learn it (it will help the teachers sing with me). You can see how I like to do that HERE. I will probably also do as A Children's Songbook Companion book suggests, "invite the children to slap their laps, clap and snap-over and over to the rhythm of the song." Great ideas. Thanks for taking the time to share it. I'm looking forward to teaching this song. It brings back memories from my Primary days. I chose this song too. So happy to find some helps. Thank you!! Awesome! Thanks! So is the taping the cards under the chairs the attention getter or is there something else? (Sorry, I know you don't want to ever post things from the book, but I was too late telling my husband I wanted the book for Mother's Day so now I need to wait for my birthday to get it. :) You don't have to tell me if you don't want, but I'm just trying to figure out exactly how I'm going to do this song. Thanks! If you will just contact me using the tab above, I can help you out.